We had to do a master copy for my Sketching for Illustration class. 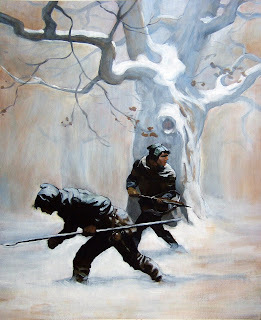 I chose to do N.C. Wyeth. We had to copy the original painting stroke for stroke, color for color, value for value. Thus I don't care if its bragging because I worked long and hard on this stupid thing so I was glad to see that "A-" on the back.